Folk Dance is finished! 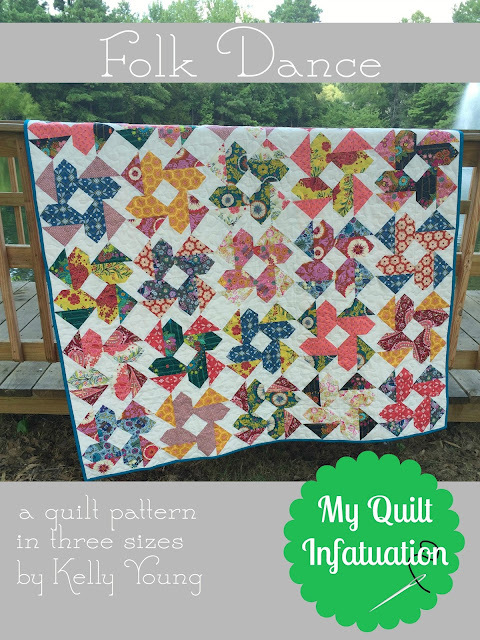 I have been working on the pattern and quilt simultaneously, and I am so happy that both are ready to show you. In case you missed my last post, when I created this pattern, I wanted to give the illusion of twirling, colorful skirts. 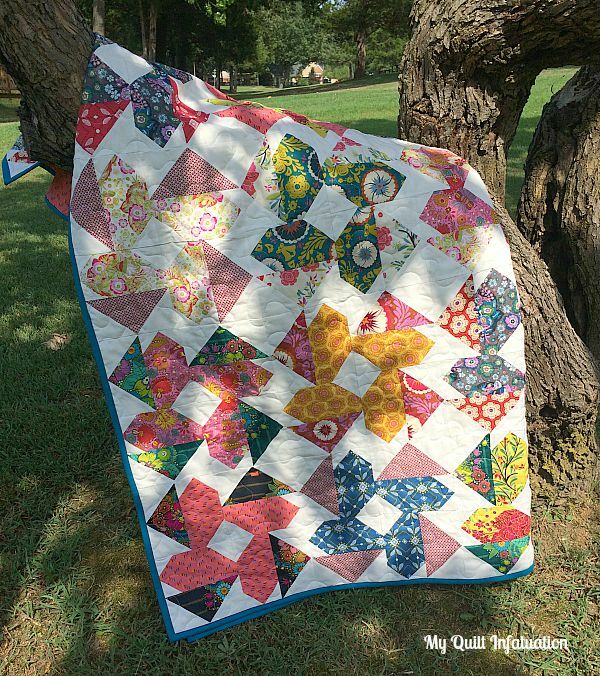 I think the combo of pattern and the Anna Maria Horner Folk Song fabrics really illustrate this beautifully! I needed 17 prints for this pattern, and the Folk Song line only has 14, so I had to pull a few extras. The first was a no-brainer. The coral print on the left is from the Dowry line, and my LQS happens to have it in stock, so I snatched some right up. I also added the Amy Butler dark red print at the top, from the Love collection, as well as the little polkadot in the bottom right corner. I picked that fabric up at my local shop almost two years ago, and I have no idea what line it is from. If anyone can help identify it for me, I'd appreciate it! AMH fabrics have such a distinct style that they can be hard to mix with others, but I love how these three blend right in. I took advantage of the fact that my local shop had plenty of the coral print in stock and used it in the backing as well. The fabrics have almost a vintage vibe going on, so I worried about putting a stark white against them in the background. I used Kona Prepared for Dyeing and it is the perfect shade of creamy white. For the binding, I chose Kona Oasis to pull out some of the cool colors in the quilt. There is so much red, coral, gold, and pink, that the teal and blue takes a little bit of a back seat, but the binding really helps pull them out. 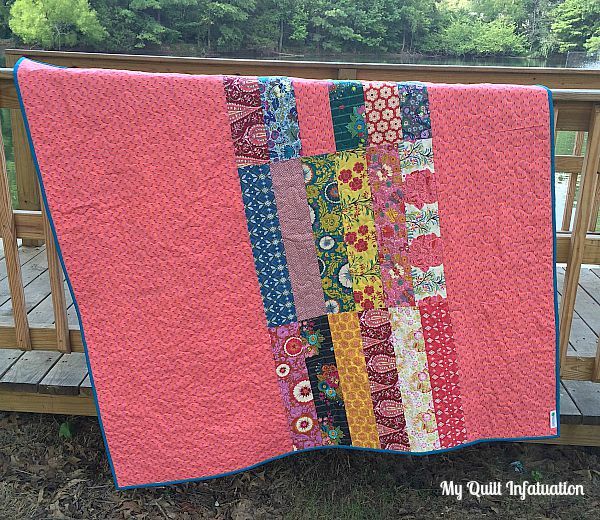 I absolutely love the way this quilt turned out, and I couldn't be happier with the pattern. It really does give the illusion of movement, and the block is simpler than you might think. Folk Dance is available in my Craftsy and Etsy shops, and I hope you'll check it out! Thank you Teje! I'm so glad you like it! Thank you so much! I got it from my local quilt shop, but they carry Denyse Schmidt prints there as well. Glad to have it identified! It's gorgeous! The fabrics blend so well. What a fun design! The blue binding was a good call. I am always drawn to the cool colours. And that binding helps to tie everything in! Beautiful job lady! Congrats on the new pattern. 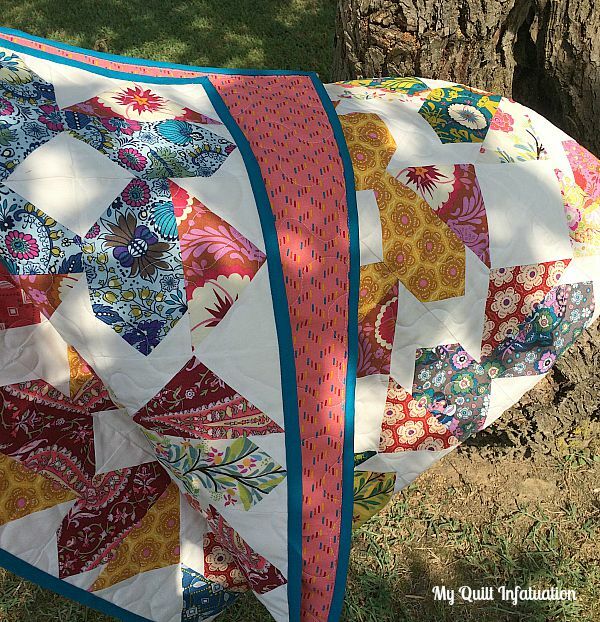 I love your AMH quilts! This is gorgeous! It just might be my favorite of all of your quilts. Wonderful design Kelly. The AMH fabrics are just perfect and the additional fabrics work beautifully to add extra color and flair to the look. Nicely done. Congrats on another pattern too. I know how hard they are get completed. Love the pattern - simple and yet effective! If I didn't already have a dozen other patterns to make, I'd be using this one to showcase some medium-large prints. Double and Triple WOW! This is just amazing! There are no words. Can't wait to see the next design. Beautifully done! 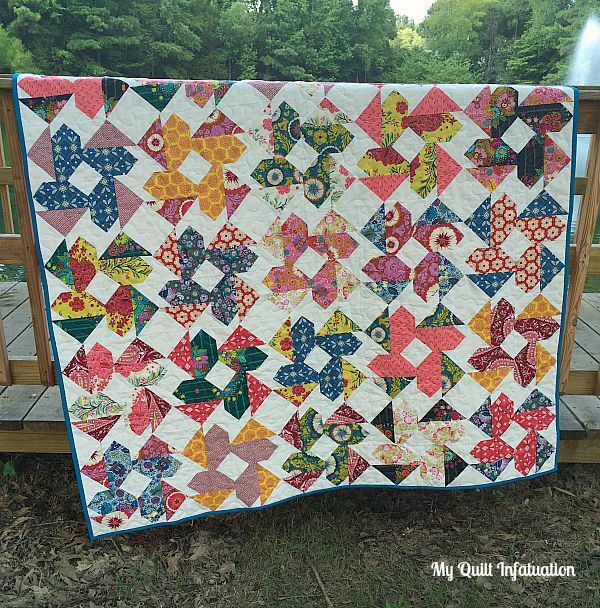 The pattern and the fabrics keep your eyes moving all over the quilt. What a a great finish. Great colour choices. It looks great. The fabrics are just made for this pattern. Very nice! Those blocks really do look like they are twirling! Really, really nice. The back is great too. Thanks so much for posting. Kelly, I love love love your quilt! This is such an awesome pattern--it really keeps your eyes moving! 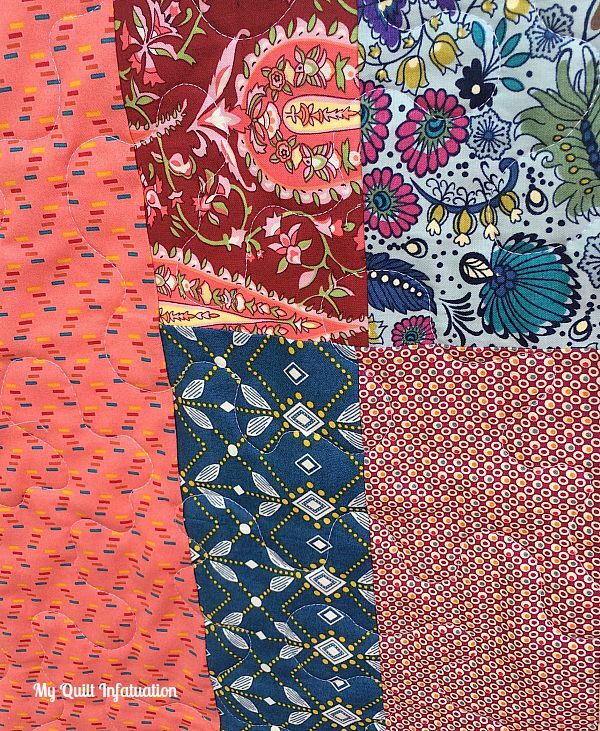 Thanks for linking up to Fabric Frenzy Friday! I have featured your post today!